Did the Chicago Bears win? They scored fewer points than their opponent. Chicago dominated in almost every way, throwing yardage, rushing yardage, +2 turnovers, but still managed to lose because they got field goal attempts out of their drives while Philly got TDs out of theirs. They should have won, but that damn referee let the Eagle coach call a time out as the ball was being snapped. The field goal would have been good. But because the ref allowed the time out they had to re-kick. No. The Bears offence did not show up and the kicker did a double-doink at the end. Ten seconds left in the game. The Philadelphia Eagles lead the Chicago Bears 16-15, but Chicago has the football, and are attempting a 43-yard field goal to take the lead with seconds left in the game. And, this happens...Choke City, Iowa. 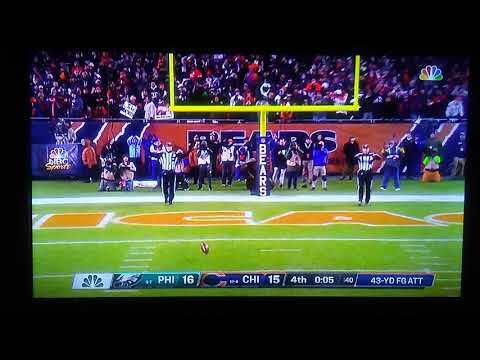 Check out the Bears mascot collapse in the end zone right behind the goal post--Hi-larious! Monsters of the Midway--my a*ss! They got beat by a second-string quarterback who was supposed to get traded this year. There's always next year Chicago. Oh wait, Aaron Rodgers will be back with a new head coach. The Vikings are gonna figure out how to best utilize Kirk Cousins, and the Lions will be better too. Let's not forget, Bears fans, your schedule is gonna get a lot harder too next year.